Arousing Appetites is a food blog run by Cyrus Roepers and Heather Rodgers on their quest to create an anthology of the world’s recipes. Each week, they learn about new a new cuisine, eating lifestyle, and cooking technique from some faraway place around the world. Of course, they make the needed adjustments to keep recipes healthy and clean eating where needed! You can also find them on Facebook and Pinterest. One key thing we’ve learned from cooking around the world is that everyone seems to love crepes. Of course we all know the French, but what about Ukranian and Nepali ones? As it turns out, almost every cuisine has its own type of crepe! 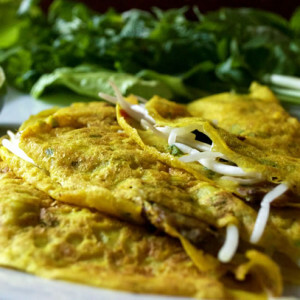 Sure enough, the Vietnamese have their own special version too, and even amid the ubiquity of a thin pancake, there is something truly unique about Banh Xeo. I’d like to challenge all October Unprocessed pledgers to use this time to break old food habits and to freely discover new ones. Let this month be the catalyst that brings you your new perfect meal or a cleaner, healthier way to prepare an old favorite. To help you on your journey and to introduce Persian cooking, I’ve got here for you an exquisite (and super-simple!) 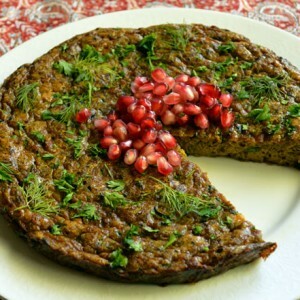 recipe for Kuku Kadoo, an Iranian-style frittata with zucchini.